They gathered by the doors at University of Johannesburg’s Soweto campus where registration for the national conference is taking place. ANC delegates sing and dance outside the plenary at ANC’s 54th national conference. Picture: Thomas Holder/EWN. 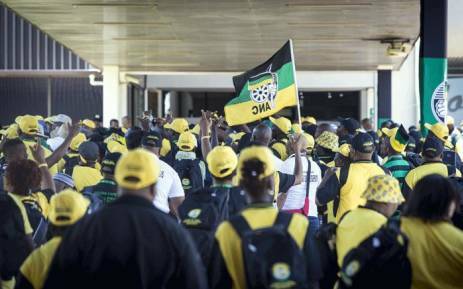 JOHANNESBURG – ANC delegates from the North West and Mpumalanga say they are ready to approach the courts because they are seeing names of people they don't know being registered to vote under their regions and wards. They have gathered by the doors at University of Johannesburg’s Soweto campus where registration for the national conference is taking place. This follows ANC Secretary General Gwede Mantashe’s announcement on Saturday morning that that all provincial structures nullified by the courts would not be allowed to vote at the party's national conference. It means that some delegates from Kwazulu-Natal, North West and the Free State will not be allowed to vote at the national conference. A police officer told delegates that he would be closing the doors, but disgruntled members from wards in Mpumalanga and the North West approached the entrance and demanded to be let inside. However, none of them could enter. Dumisani Masina, from ward seven in the Ekangala branch in Mpumalanga, says they are angry because no one is explaining why there are people registered under their area that they don't know. Mogapi Marumo, from ward 24 in the Matlosana sub region in the North West, says they are ready to take this matter to court. Mantashe supposed to address the media but left a short while ago. In a separate dispute, Tshwane regional delegates have also gathered at UJ Soweto campus demanding their leaders remove their representative from the conference, saying he cannot vote as their branch general meetings didn't materialise. Delegates from a branch from Mpumalanga say they are aware they will not be allowed inside the main venue in Nasrec, but were surprised to find a list of names under their branch that they don’t know. Raphael Tloubatla of the Tshwane region he says they have always had only one delegate representing them, but they don’t want him at Nasrec because the branch did not have successful general meetings. He adds this delegate won’t know who the branch wants as ANC president. He says the ANC only seems to listen to grievances when they approach the courts. In the North West, delegates from the Matlosana sub-region say they are experiencing the same problem.